Sunlight & stairs flow downward from hatchway. Photo taken from bridge (from east). 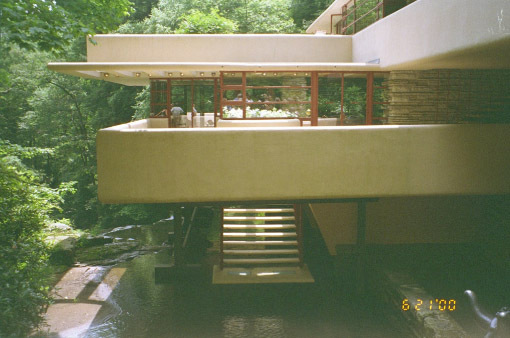 One of the features of Fallingwater that Frank Lloyd Wright made clear was not negotiable was the staircase to a shallow spot in the stream below. An important symbolic function of this stairway is to connect the house to the stream. In doing so, it provides the house with a key vertical feature, and can be seen as an artistic integration on several levels. The bottom step of the stairway reaches down (with no supports from below) to a point just over the stream (depending on the water level that day), and the top of the stairway is inside the living room (or great room) via a "hatchway" with sliding glass panels. Human "traffic" (though lighter than that word normally suggests) can flow down right from the main room in the house to the stream itself, echoing the flow of water over the falls. Viewed from the outside of the house, this human "flow" originates from the dramatic catilevered edifice that is the main floor, and can be compared to the water flowing over large rectangular rock ledges. The living room opens onto the terrace in the foreground from double doors on either side of the hatchway stairwell; those on the left set back. The trellis above adds to the vertical theme of the hatchway. It is open to the sky, and also extends horizontally into the living room, two of the many suggestions of the continuity of inside and outside. Supports visible under the terrace (to the left of the stairs) were a temporary measure while repairs were made. Click here for another photo taken before these supports were put in place. Click here for a photo of this southeast part of the house and opposite bank, taken from slightly to the left and at a wider angle. Click here or on photo for much larger (1536x1024 pixel, 413k) version. The spatial and immaterial values discussed earlier can be illustrated by tracing my own slow discovery of some recondite but powerful elements of Fallingwater's design. These are visible in drawings and photographs, but their actions and interactions are unlikely to be sensed until experienced on the site. To begin with, my father, in examining the plans, questioned the value of steps leading down from inside the living room to the stream. The water was shallow in this stretch, impractical for even a dip. The steps would be extravagant to build and would complicate the structure of the house. Granting this I felt that Wright wanted to keep the main room in touch with the movement and energy of the run, and I pleaded for trust in Wright's intuition. Wright himself considered the steps not so much a proposal as a decision. Eventually my father agreed and the steps were built. Only later I began to think about the steps in conjunction with the glazed trellis above them. Clearly Wright had gone to some length to achieve transparency along a vertical axis here; the eye could look down to the run and up to the sky. Diagonally across the room stood the great, solid chimney wall. I then saw the pair as a column of stone and a column of air making a precinct, and was pleased with the discovery though ashamed of recognizing it tardily. 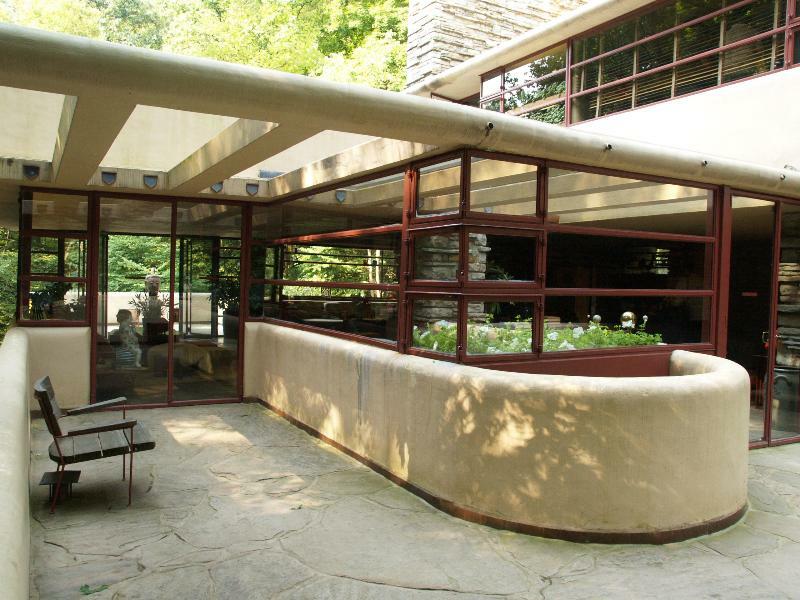 - Edgar Kaufmann, Jr., Fallingwater: A Frank Lloyd Wright Country House, p. 172.